We created BusyLamp to remedy the challenges of working with outside counsel. In-house counsel has historically had difficulties with the rising costs of legal services, matter management, and communications with outside counsel when it comes to legal billing. By eliminating these obstacles and helping reduce the costs of legal services, as well as the friction between in-house counsel and outside counsel, we hope to fulfill a pressing need. But how well are we succeeding with this mission? And how do you measure success? Excuse the pun, but what’s the verdict on BusyLamp? 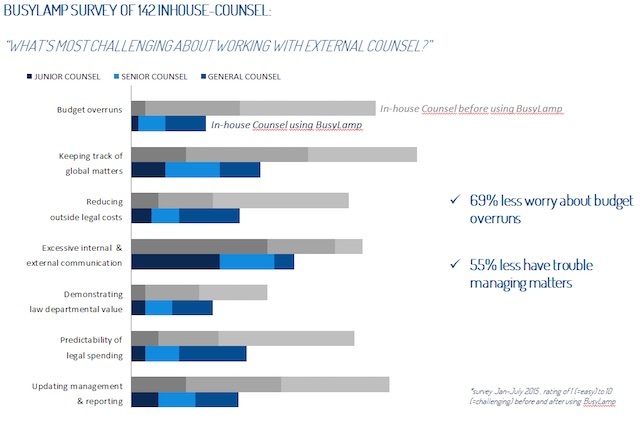 To answer these key questions, we conducted an exhaustive survey: “What’s Most Challenging about Working with External Counsel?” Between January and July 2015, we polled 142 in-house counsel, including junior counsel, senior counsel, and general counsel about their experiences before using BusyLamp and after using BusyLamp. The results of the survey showed improvement across the board. In addition to 69% of participants citing fewer worries about budget overruns and 55% less trouble with matter management, counsel also reported an overall decrease in outside legal costs, a better experience with law department value demonstrations, better management updates and reporting, and better internal and external communication. Keeping track of global matters. Reducing excessing internal and external communication. The survey illustrated the most common complaints in-house counsel have regarding external counsel, and the results suggest BusyLamp streamlines processes and decreases overall costs. Non-transparent billing can lead to trust issues between the in-house counsel and the firm. In-house counsel know that they are billed by the hour, but sometimes they have no idea whether the deliverables generate true value. Hourly billing can be unpredictable. In-house counsel are dissatisfied when their bill winds up being significantly more than originally estimated. Billing mistakes and miscommunications leads to friction, allegations of misconduct or bad faith and bloated budgets. Many firms dismiss this kind of inefficiency as the price of doing business – an inherent part of the process that can only be fixed through austerity (which can, for obvious reasons, stress the working relationship). However, our survey shows that inefficiencies are not inevitable and that simple, flexible technology can not only slash costs but also improve the satisfaction of everyone involved. Not to invoke an overused business trope, but BusyLamp does lead to “win-win” outcomes for all stakeholders. BusyLamp clearly reduces challenges for in-house counsel, leads faster bill payments and generates repeat business. Here’s more good news. You don’t need to throw out all your old ways of doing business. Companies interested in curtailing rising legal fees and creating a transparent process for all activities from the RFP process to billing can still use legacy tools and processes. However, making a bigger transition is also a snap: our SaaS platform provides complete flexibility, data protection, and support. The simple usage-based pricing model also makes BusyLamp affordable for every size company, and you can access the platform from any device you regularly use. BusyLamp enables your company to make informed financial decisions, reduce overhead costs, and secure timely, cost-effective results.